Not much remains of J. Michael Malloy’s pioneering interactive art work “Insure the Life of an Ant,” shown at OK Harris Gallery in 1972. Today few people have even heard of Malloy, who abruptly stopped making art soon after this controversial exhibit closed. The work involved viewer participation, with gallery-goers first paying 10 cents to “insure the life of an ant” and then entering a private space reminiscent of a voting booth. Here they confronted a plastic box containing a live ant, and had decide whether to save the ant or to push a button that would kill it with the freezing agent Freon. Noted art critic Gregory Battcock praised the work in Arts magazine as being emblematic of a new strain of behavioral art, but more than a few gallery-goers loudly objected to the morality of an artwork that involved killing a live animal. Because the exhibition took place in the pre-Internet era, Malloy’s work escaped the sort of wider outrage that has greeted similar works in more recent years. Yet the commotion was more than enough for the cerebral artist, who destroyed the components of the work and retired from art making. “Insure the Life of an Ant” has lived on primarily through snapshots and a description at the website 98 Bowery. More recently, art historian Gerald Silk revisited the work for a 2012 College Art Association panel on art and ethics. Gallery 98 has recently unearthed two previously unknown documents connected to “Insure the Life of an Ant”: a one-page description of the piece written by Malloy to solicit gallery interest; and a two-page letter from Malloy trying to recruit an attendant for the booth at OK Harris Gallery. For more information about the Malloy collection, contact Gallery 98 directly. From description of “Turnstile-Booth Situation #1,” 1972. From letter, January 20, 1972. 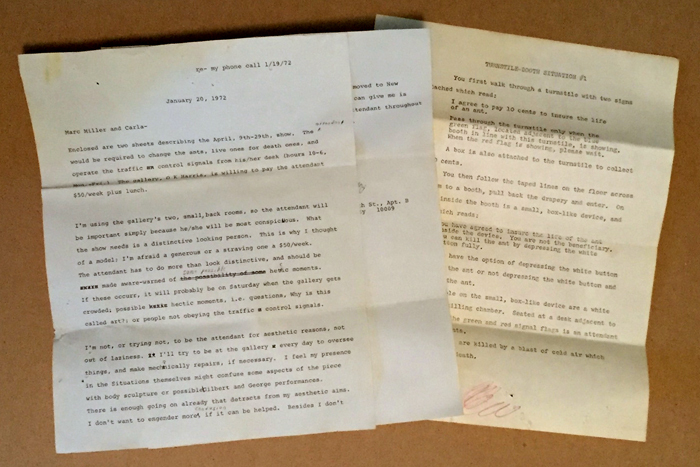 Two-page letter and one-page description of work, 1972.